Are you a creative entrepreneur? Let's spend a few hours together building a business you love! 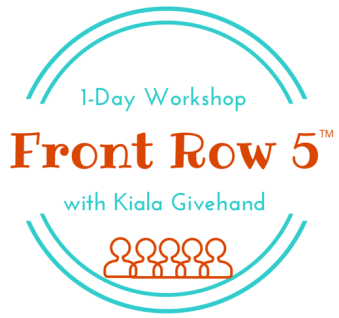 Your Front Row Five™ are the people that make up your target audience. They are the ones you're are in business to help, teach, guide, heal, or transform. When business owners focus their attentions on knowing, understanding, and building relationships with those in the front row, amazing outcomes can be seen. YES!! If you are an online business owner, you need this workshop. Even if you think you know your ideal client or your perfect customer, this workshop will help you take that to another level. I offer a perspective that may not be what you've heard or read about. It's for the business owner who wants to cultivate community authentically. Helps you communicate your offers quickly and easily. Makes blogging, writing marketing materials, and email communication more pleasurable because you know exactly who you're talking to and what you want to tell them. Keeps you from overwhelming your ideal customer, and instead, getting right to the point of how you can help them solve their problems. Get's you started on branding your business and your message. Inspires you to generate awareness, sales, and create the offerings they need. Kiala Givehand is a multi-passionate, creative entrepreneur who helps other creatives identify and embrace their gifts, talents, & passions in order to live the life they most desire. 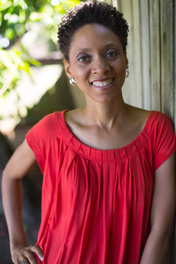 She has a 20 year career as a k-12 teacher, college professor, educational technology liaison, and curriculum developer. Her knowledge of social media stems from her days as a teacher trainer where she was always an early adopter of new technologies. Currently Kiala serves clients as both a creative business strategist and a behind the scenes secret weapon. Kiala has helped thousands of teachers move their content into an online format and now works with highly motivated business owners as they take their messages global by offering e-courses. Her other "hats" are: mixed media book artist, art journal keeper, editor, publisher, and curator of blogs. Her gifts, talents, & passions have all lined up to bring you a weekly webinar and several e-courses that help you create a business you love. Join Kiala each week for Wednesday Webinars to learn how to thrive in your business. Visit her personal page at kialagivehand.com or check out her additional offerings HERE. To read a full (and semi-formal) bio, CLICK HERE. WOOHOO!!! I'M READY TO CONNECT TO MY COMMUNITY! Our community of creative entrepreneurs is filled with soul-centered, action takers who love what they do. They want to build business they love and my goal is to help make your dreams reality. Sign up to receive tips, strategies, and mindset shifting ideas to help you on your journey. *Some links on this site/blog are affiliate links. Creative Business Strategist is owned and operated by Kiala & Damon Givehand. ©2015-2018, Kiala Givehand. All rights reserved.